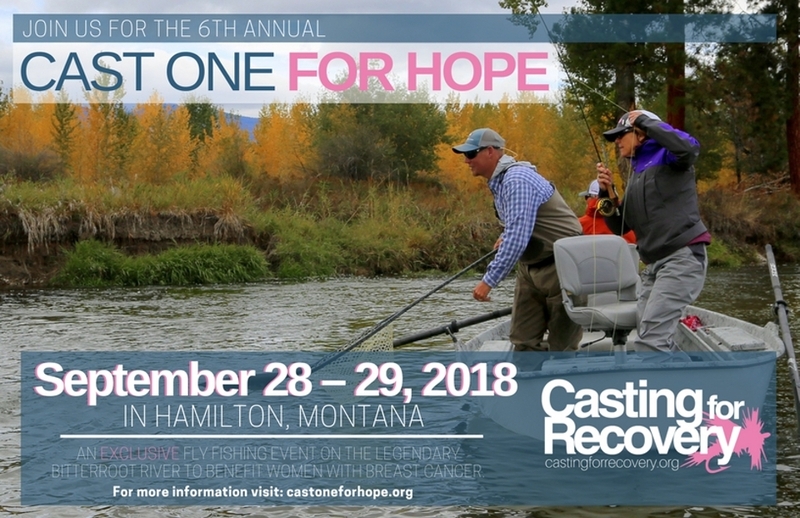 Casting for Recovery, a non-profit organization offering free support and educational fly fishing retreats for women with breast cancer is excited to announce its 6th annual Cast One for Hope event to be held September 28-29, 2018 in Hamilton, MT. This year’s event includes a Kick-Off Party, an all-day guided float on the Bitterroot River with awards given, and caps off with a Celebration Dinner showcasing live and silent auctions. Joining us again this year are members of Sisters on the Fly the largest outdoor adventure women’s group in the US supporting women in their journey to get up, get out and become more adventuresome. The Sisters will be on site the entire weekend. “The Cast One for Hope is a chance for anglers to experience an unforgettable day of guided fly fishing while supporting a great cause. Anglers from across the country are out on the beautiful Bitterroot River in the fall to raise money to offer the CfR experience to women who have been diagnosed with breast cancer” says CfR Executive Director, Whitney Milhoan. Cast One for Hope sponsors to date are American Fly Fishing Trade Association, Adipose Boatworks, New Horizons Physical Therapy, F3T Fly Fishing Film Tour, Cheeky, Farmers State Bank, Angler’s Roost. Other sponsors are continuing to be sought for the event. To learn more about the Cast One for Hope and to register follow this link.